In the Round A freestanding sculpted work that can be viewed from all sides. Relief A raised form on a largely flat background. Bas-Relief (Low Relief) A sculpture carved with very little depth. Sculptor's marks are shallow. High Relief A carved panel where the figures project with a great deal of depth from the background. 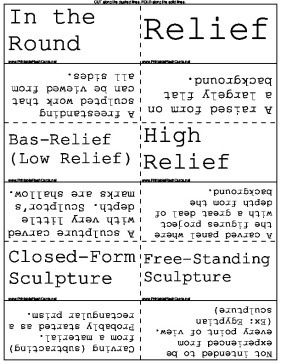 Closed-Form Sculpture Carving (subtracting) from a material. Probably started as a rectangular prism. Artifact An object made by a person. Found Object An object found by an artist and presented, with litle or no alteration, as part of a work or as a finished work of art in itself. Kinetic Sculpture Sculpture that moves. Methods of Sculpture Carving, modeling, casting, earthworks, construction, and readymades. Carving Subtractive method of sculpture. Modeling Additive process that usually uses clay and wax. An armature is used with clay. Casting Additive process that involves adding a liquid or pliable material to a mold. Lost-Wax Process. Earthworks Additive process on a large scale. Monumental sculptures that used the Earth's surface as material. Construction Additive process. Duh. Considered relatively new. Readymades An everyday object presented as a work of art. An artifact or a found object. Installation Sculpture Involves the construction of a space or the assembly of objects to create an environment. Space is used as the fundamental element.